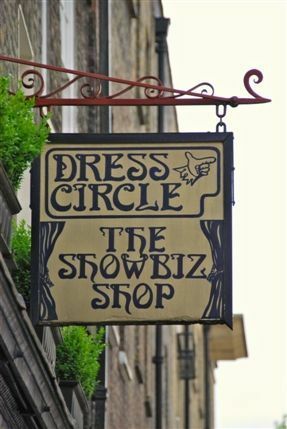 Saturday morning saw the first in a series of events organised and performed by West End stars as part of an effort to save Dress Circle, the ‘Showbiz Shop’ that has also become an institution and a hub for music theatre fans in London. Dress Circle has run into financial difficulty, and a front page article in The Stage last month highlighted that rising costs may force the outlet to close, leaving only an internet operation (dresscircle.co.uk). This provoked sadness and outrage amongst the theatrical community, and has sparked a series of events such as this one in an effort to save the shop. The event itself was a great morning of entertainment – organised by the actors Stuart Matthew Price (currently in Shrek the Musical) and James Yeoburn, they persuaded a host of talent from the West End to perform at the Covent Garden shop at 11am before they headed off to start their two-show days with Saturday matinees. It was a treat to be at such an intimate showcase of new British writers. Stuart Matthew Price performed one of his own songs, and was followed by the composers Dougal Irvine & Richard Beadle. Performances came form Emma Williams & Stephen Ashfield, Shona White and the fantastic Hannah Waddingham. Topping off the event were George Stiles & Anthony Drewe, who sang ‘A Little Bit of Nothing’ from their album ‘A Spoonful of Stiles & Drewe’ and some previously unseen material. 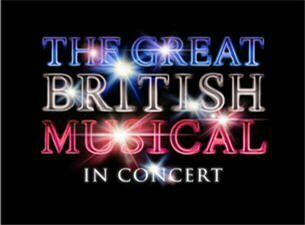 It was all lighthearted and fun, but at the same time demonstrative of the great British music theatre output that I love to bang on about so much. There are more events in this series coming up – 11am this Saturday sees a ‘Leading Men’ event with signing and performances from Ramin Karimloo, John Owen-Jones, Matt Rawle and Alex Gaumond. A final, large benefit is planned for August 7th. Get your diaries out and keep an eye on the Dress Circle facebook page for further details. The plan to save Dress Circle is a noble one – this little shop is often the only place where fans of musical theatre get to meet those writing and performing the shows that they love so much. It has a fantastic selection of merchandise and a great atmosphere – there’s a very particular type behind the till, almost always ready to have a musicals-based chat, and often grasping a glass of wine as they do so if you pop in of an evening. It’s a gem and shouldn’t be lost. However, these events can only entice short-term spending rather than ensure better financial performance long term (as a ‘fish’ rather than a ‘net’ if you excuse me channelling the old adage). In order to survive in the long term, Dress Circle will inevitably have to change its strategy. I’m not just waxing lyrical on this – when I’m not writing this blog I pay my bills with a job in finance, and as I write am avoiding revision for a ‘Business Change’ exam. Dress Circle has a great unique selling point – it has all of those rare albums that musicals fanatics just can’t get anywhere else. Fans love browsing the shop for the chance to immerse themselves in the West End, and artists love selling their music there because very few other places will take debut albums from fledgling West End stars (many are not even available on iTunes). The Stage article blamed the losses of the shop on the reduced amount of merchandise being produced by West End shows, but I would be readier to point the finger at the increased competition from downloaded music. These changes in the market are irreversible, and Dress Circle needs to adapt if it is to survive – it has to capitalise on its strengths and, if the competition from downloading is getting too much, it has to either beat the technological revolution, or join it. 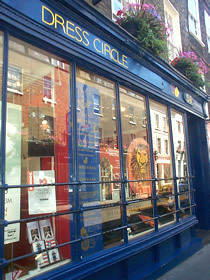 If it wants to survive as a shop, Dress Circle will have to promote itself much more – marketing would be the key. I met a serious young actor on a day trip from Bolton to London a couple of months ago and he was delighted to learn that a shop existed – he was a big user of the website but had no awareness of the Covent Garden store. So many tourists come to London to see West End shows, and if they could somehow be enticed into Dress Circle as well, it would be difficult to see how takings wouldn’t increase, but they need to be made aware of its existence in order to show up. One quote from the benefit was ‘you can’t sign a download’ – this is true, and the special feeling of meeting your idols and coming away with a personalised product can’t be beaten by iTunes. This is a massive strength of the shop. Yet, equally, generation Y are notoriously impatient (I am 100% guilty of this). We are used to being able to Google information and receive an instant response, and have become used to having music at our fingertips in the same way. If I see a show and come home desperate to listen to the album, I may head straight to iTunes. It’s quicker & cheaper than buying a CD and I don’t have to store countless boxes as a result. I get my music within seconds and don’t have to pay delivery costs. Those motivations aren’t necessarily worthy or responsible, but they are unavoidable and are one of the million reasons that Apple makes a killing out of its service. Dress Circle doesn’t have to lose out here though – if they could develop their own downloading service, they could benefit from these advantages too. You can’t sign a download, but equally not everyone will get every album they buy autographed. By offering their unique range on their own download service, Dress Circle could compete with iTunes, and with their niche could corner the musicals market. To develop a download service and have a significant marketing drive obviously needs investment and expertise – with no spare cash, Dress Circle needs a significant injection of finance if it is to achieve such change. Hopefully a suitable investor who understands the quirky reasons why this shop is so loved and unique can be found. If I had the cash I would make an investment in this place tomorrow. It is not only close to my heart, but an example of a targeted business with hugely loyal customers in a prime West End location. So, head down to the next benefit, or just pop in next time you’re in Seven Dials. This is a place not to be missed. Also, if you’re a billionaire looking for a more exciting investment than most, please get in touch! The next Dress Circle Benefit ‘Leading Men’ will take place on Saturday, June 11th at the store – 57/59 Monmouth Street, London WC2H 9DG. You can follow the benefit on Twitter – @dcbenefit, and a website will soon be up and running here: http://www.dresscirclebenefit.co.uk. The organisers can be contacted on dresscirclebenefit@gmail.com. Stephen Fry hosts a showcase of songs from new and exciting British musicals in aid of the production company Perfect Pitch. incontrovertible proof that the musicals genre is in rude health in this country, and deserved all it was awarded and more in the allocation of ACE funding last week. Fry has been very vocal of late in his support of musicals, and with his trademark quirky quips made an extremely strong argument for supporting British musical theatre talent, highlighting that the collaborative nature of musicals mean that they are in particular need of funding due to the variety of input needed to showcase and get them off the ground. With such a powerful media presence as Fry behind the British musical, one can’t help but feel positive about its future prospects. Through his dominance of Twitter, he can dictate the (inter)national conversation in a way unparalleled by any other celebrity figure. His insistence that the future of the arts should never be left entirely to the free market, possibly to be replaced by a ‘leaner, more efficient Taiwanese version’ appealed to both the audience’s sense of humour and their concerns for their beloved theatrical institutions. The performances that followed certainly proved Fry’s point. Extremely strong performances from Stuart Matthew Price (whose own composition ‘Where I Wanna Be’ was so impressive that it is currently downloading on my iTunes…), Julie Atherton and Michael Xavier lived up to the audience’s high expectations for these performers who have long been beloved by discerning West End theatregoers. The night was also laced with a few welcome surprises – Emma Barton glistened with star quality singing ‘Do You Want a Baby Baby?’ from Dougal Irvine‘s The Busker’s Opera, with vocal talent and perfect comic timing evident in every phrase. George Stiles & Anthony Drewe themselves performed ‘Nobody’ and the title song from their wonderful new musical Betty Blue Eyes, proving themselves to be natural performers as well as legendary creators of contemporary music theatre. Stevie Webb & Jack Shalloo also highlighted themselves as talents to watch with their rendition of ‘Long Sunday Afternoon/That Guy’ from Blood Brothers. As those of you that read my Billy Elliot review last week will know, I’m not a great fan of the show, but their rendition was so engaging that it did what I thought impossible and won me over (after initial groans at seeing the listing in the programme). Proof as ever how much of the enjoyment of a song is dependent on it being done justice by a great performance. A fantastic, if not perfect, night (the usual one-night problems of technical sound glitches affected some performances). I left with a spring in my step and a long list of new shows to explore. It’s going to be extremely exciting to see what Perfect Pitch come up with next. Star quality.